We are an Irish-owned professional pension trustee company, established in 1994. We are based in Harmony Court in Dublin city centre and employ 50 staff. Our focus is on delivering flexible and transparent pensions for our clients. We are now one of the largest providers of self-administered pensions in Ireland. We administer €1.2 billion of client funds in 4,000 pension structures. We act as trustees of self-administered pensions schemes, which typically have one member. We also act as trustees to larger occupational schemes, which can have a large numbers of members, and private trusts. 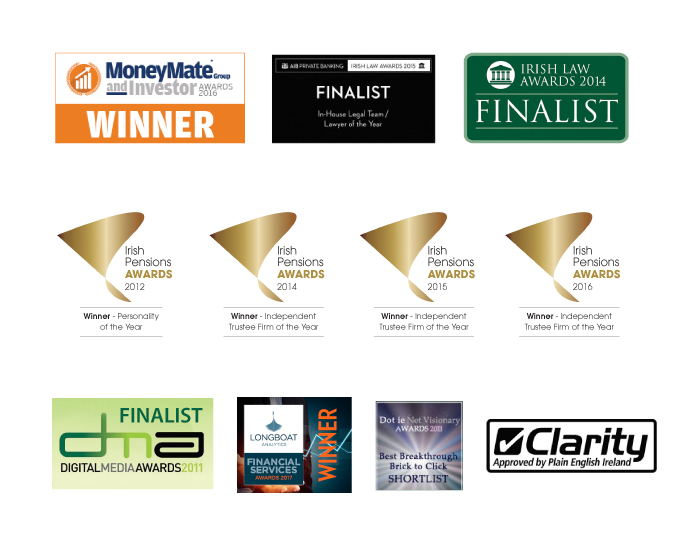 Our clients are self-employed individuals, professionals, company directors, corporate clients, financial advisors and high net wealth Irish and international individuals and families. We pride ourselves on our high-quality professional pension trustee service and are known for our technical skill. We ensure that our staff have the expertise to provide a highly efficient and professional service to our clients and advisors. Our technical department – of specialists, accountants, tax consultants and solicitors – reviews and interprets changes in legislation. This enables us to provide comprehensive guidance so that you gain full advantage from your pension structure within Revenue guidelines. Approved by the Revenue Commissioners as a Pensioneer Trustee. Recognised by the Pensions Board as a Registered Administrator. Regulated by the Central Bank of Ireland as an investment firm. Approved as Trustee Trainers by the Pensions Board. We are also one of the founding members of the Association of Pensioneer Trustees in Ireland. We are delighted to have won a series of prestigious Irish Pension, Investment, Marketing & Internet awards over the past four years. We have also been shortlisted for a number of other awards and have our customers to thank for supporting us. We are committed to making our website clear and easy to read. We submitted our site to a rigorous external check of language and layout by Plain English experts. Our site has achieved a high standard of clarity and uses plain English. Plain English Ireland will continue to monitor the site at regular intervals to check that standards of clarity are being maintained. However, the website is frequently updated and if you notice any unclear or badly worded content, we would like to hear from you so that we can make corrections. NB: Forms and press releases are not covered by this quality mark.